Several times during the summer and early fall, Mike Poe of Siler City, North Carolina, sent reports to the Finesse News Network extolling the effectiveness of Z-Man Fishing Products' 1/16-ounce ChatterBait FlashBack Mini. In his first report, he wrote that he fished for 45 minutes with a 1/16-ounce, silver-and-blue ChatterBait FlashBack Mini and waylaid 25 small largemouth bass and two mega bluegill. He exclaimed: "This bait is a killer, and its plastic body has survived the attacks of about 35 bass and a dozen crappie and brim." He wielded it on an ancient custom-built fiberglass Fenwick 505 blank, and his spinning reel was spooled with 10-pound-test braid and a short eight-pound-test monofilament leader. He was casting and retrieving it parallel to the outside edge of some flooded terrestrial vegetation. He closed his report by noting "that its flash and action is amazing for such a tiny bait." In another report, Poe wrote: "I think this bait would be a nice addition to a finesse angler's bag of tricks when a horizontal presentation is in order. It comes packaged with a minnow-shaped trailer and a curly-tail grub. I have only used the minnow-shaped one so far, and it is a very unique trailer." Until Poe posted his reports on the Finesse News Network, most finesse anglers in the Midwestern states had not crossed paths with the ChatterBait FlashBack Mini. Straightaway several veteran anglers, who reside in the great white bass triangle that stretches from northeastern Kansas to northeastern Oklahoma to central Missouri, thought it would be an ideal tool for bewitching white bass on wind-blown points and shorelines on autumn afternoons and evenings. To garner more information about it, we consulted with Daniel Nussbaum and Glenn Young, who work for Z-Man. 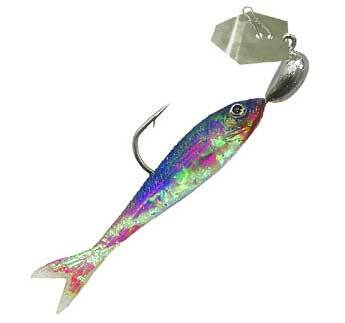 Nussbaum wrote in an e-mail: "We've been selling our ChatterBait FlashBack Mini since 2007. We don't sell replacement bodies for the bait, but fortunately, those little ChatterBaits work great with a variety of trailers. "In my mind, the biggest highlight of this bait is that it is so easy to fish — all you have to do is cast it out and retrieve it slowly, the bait does the rest. Much like the finesse system you've developed, it's a great lure for kids and beginners for this reason. "I think another advantage of this bait is its novelty and uniqueness. In pressured areas, fish have likely seen the same lures thrown at them time and again. These little ChatterBaits offer a little bit different look, action, and profile than standard jigs, grubs, and spinners. Several years ago, we had a huge run on these baits in North Carolina, Virginia, West Virginia, and Tennessee when trout fishermen realized how effective the 1/16 oz version of this bait was in heavily pressured trout streams. "The final highlight of this bait in my eyes is its versatility. Again, much like your finesse system, it will catch just about anything that swims. I've caught everything from bluegills and largemouth in freshwater to seatrout and redfish in saltwater on these little baits." Young responded, saying in an Oct. 19 e-mail: "Daniel's right about the versatility of that bait. It will catch virtually anything that swims and I can attest from personal experience that it is a white bass killer. "One of the really effective techniques on white bass when they're busting bait is a faster retrieve with the 1/8-oz. version right on the surface. "As far as different baits to use as a trailer once the body wears out, I've used a cut down Finesse WormZ and a 2 1/2-inch GrubZ with really good results." The 1/16-ounce ChatterBait FlashBack Mini is two-inches long. The 1/8-ounce rendition is 2 1/2-inches long. They are available in five colors: gold-black, silver-natural, chartreuse-firetiger, silver-blue, and chartreuse-rainbow. Each body is embellished with holographic foil, which provokes an array of glittering flashes. The prices for the 1/16- and 1/8-ounce models vary from retailer to retailer, ranging from $2.89 to $2.99. Clyde Holscher, who is a multispecies guide from Topeka, Kansas, says he and his clients have successfully used the 1/8-ounce Chatterbait Mirco, which they have dressed with a variety of trailers, for smallmouth bass and temperate bass at 5,090-acre power-plant reservoir. He plans to test the Mini for white bass on wind-blown points and shorelines during the next few weeks. He suspects that his novice anglers will have a difficult time wielding the 1/16-ounce Chatterbait Mini. Therefore, he will see what they can do with the 1/8-ounce model. Anglers who are interested in fishing with Holscher can contact him at 785-267-0065.